Homo sapiens is the only species that knows it will die. The thought obsesses us. From the earliest marks made on cave walls to our most sublime works of art, the fear of death haunts our every creation. And in the middle of the twentieth century, human beings became the first species to reach that pinnacle of evolution – the point at which it could engineer its own extinction. In February 1950, as the temperature of the cold war approached absolute zero, an atomic scientist conceived the ultimate nuclear weapon: a vast explosive device that would cast a deadly pall of fallout over the planet. Carried on the wind, the lethal radioactive dust would eventually reach all four corners of the world. It would mean the end of life on earth. One of the founding fathers of the atomic age, Leo Szilard, stated that it would be very easy to rig an H-bomb to produce lethal radioactivity. All you had to do, said Szilard, was surround the bomb with a chemical element such as cobalt that absorbs radiation. When it exploded, the bomb would spew radioactive dust into the air like an artificial volcano. Slowly and silently, this invisible killer would fall to the surface. ‘Everyone would be killed,’ he said. In the 1950s – the doomsday decade – the fallout from his chilling suggestion spread fear around the world. For many it seemed as though the biblical story of Armageddon was about to be realized; the seventh angel would empty his vial into the atmosphere, and it would contain radioactive cobalt-60. The story of the cobalt bomb is an unwritten chapter of the cold war. 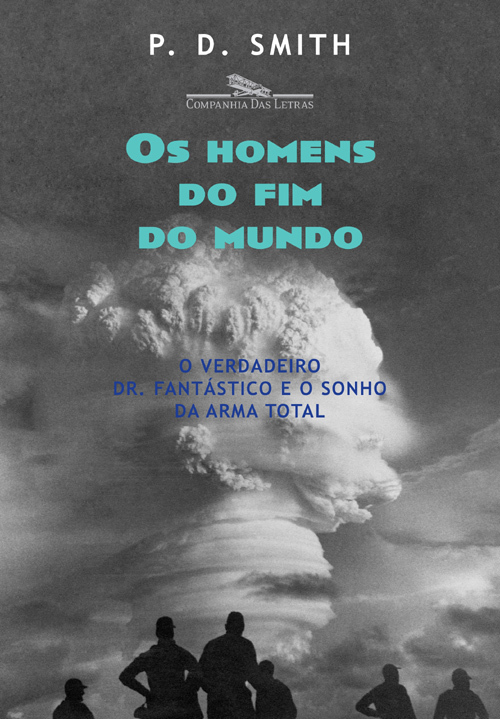 In my new book Doomsday Men: The Real Dr Strangelove and the Dream of the Superweapon I explore its history and cultural impact for the first time. For Szilard it was a dramatic way of warning people about weapons of mass destruction and the escalating arms race. Scientists had been praised by many for curtailing World War II with the atomic bomb. But in the cold war the creators of these apocalyptic superweapons were seen as holding the fate of the world in their hands. They had transformed the laws of nature into instruments of mass destruction and, as far as the public was concerned, there would soon be little to distinguish real scientists from that fictional master of megadeath, Dr Strangelove. Leo Szilard said that it was the ‘tragedy of mankind’ that the story of the atomic bomb began with laudable hopes for a better future. At the beginning of the twentieth century, people had marvelled at the hidden worlds revealed by X-rays and were awestruck by the mysterious glow of the new miracle element, radium. As Doomsday Men shows, such discoveries offered tangible hopes that a new age was dawning. It is said that Leo Szilard was the most brilliant scientist never to have won a Nobel Prize. His vision of an atomic utopia was inspired in part by the fiction of H. G. Wells. I first came across this remarkable Hungarian-born scientist while researching Einstein’s life. The two men were great friends and collaborated on one of the great forgotten research projects of the last century – a household refrigerator (it should be said that it was rather a revolutionary one). I soon realised that Szilard’s life epitomised the glories and the follies of science in the twentieth century: the story of the Doomsday Men could not be written without him. The scientists who would lead the world into the atomic era emerged from Berlin’s golden age of physics in the 1920s. Among them was Szilard himself, known to his friends as the ‘inventor of all things’. The story of Szilard’s mission to save the world takes us through the first, explosive years of the atomic age and into the cold war. It is a story that features three of his fellow countrymen: Eugene Wigner, John von Neumann and Edward Teller. Together they were the Hungarian Quartet, a group of remarkable scientists who all played leading roles in the Manhattan Project to build the atomic bomb and later became key figures in cold-war America. All were inspired by the dream of the superweapon. In the twentieth century, scientists were raised up to be gods only to be cast down as devils. Films and fiction first turned them into saviours who free the world from war. But as fears grew about superweapons, those saviour scientists were transformed into mad scientists. However, the history of weapons of mass destruction in the twentieth century is not just about soldiers and scientists. To explain why some of the most gifted and idealistic men of the twentieth century spent so much effort trying to destroy the planet, I needed to pursue the origins of these hopes and fears, not only in the lives of the scientists but also in films, fiction and other popular media. For humankind’s most terrible yet ingenious inventions were inspired by a desperate dream, one that was shared by a whole culture. It is a dream that may yet turn into a nightmare for us all. Leo Szilard also played a little-known but crucial role in inspiring the Doomsday Machine that ends the world in Stanley Kubrick's cold war classic Dr Strangelove or: How I Learned to Stop Worrying and Love the Bomb. This features in the book but I have also discussed it in a blog here. As I explain in my book, 'Perimetr' is the code-name of the computerised system designed to protect the Soviet Union against a sneak nuclear attack from the US. Also known as the Dead Hand, it bears an uncanny resemblance to the 'Doomsday Machine' described in the film Dr Strangelove. It went operational in 1985. As far as anyone knows, it remains combat alert today. On new information that came to light in 2009 about the Dead Hand, see my piece here. Doomsday Men and “The Return of the Doomsday Machine” in today's Russia is the subject of an interesting article by Ron Rosenbaum at Slate Magazine. There have also been pieces on this by Brandon Keim at Wired, by Kevin Arthur at Question Technology, and Simon Rohling at the German site Telepolis (among many others). Bill Hammack of WILL Radio’s ‘The Afternoon Magazine’ has interviewed me about Doomsday Men. To hear this 45-minute programme click here (MP3) or visit their archive page here. You can also listen to an interview I did on Doomsday Men and the Cold War for the BBC's The World Today below. My paper "Faust, the Physicists and the Atomic Bomb" (based on a lecture I gave in 2006 and published in 2008) explores themes discussed in my book Doomsday Men, in particular the cross-fertilization between science and literature in the 1930s, at key moments in atomic physics and in the development of the atomic bomb. Read more here and here. I have also written a chapter entitled "Gentlemen: You are mad!’: Mutual Assured Destruction and Cold War Culture" for the Oxford Handbook of Postwar European History (OUP, 2012), edited by Professor Dan Stone. Clare Dudman interviewed me in 2009 for her literary blog, Keeper of the Snails. In December 2014, Sanford Simons - the "Plutonium Collector" whose story I told in Chapter 3 of Doomsday Men - died. I wrote a piece about why he took the sample of plutonium in 1946 and what happened to him afterwards. You can read it here. "Books on nuclear physics aren't often entertaining to the layperson, but Doomsday Men is comprehensible and fascinating, although likely to send one scurrying to lead-line the cupboard under the stairs just in case." "Written with all the pace of a thriller, this is a compelling, and ultimately extremely chilling, look at the way scientific discovery has always gone hand-in-hand with warfare". "It is a tremendously rich and rewarding book, a magnificent accomplishment - and, I think, an important one." "It is an impassioned account of everything from the discovery of radioactivity to plans for a Doomsday Device (yes, there really were such plans) from an author who feels that to the generations growing up who see the Cold War only as something in history books, the true horror of nuclear weapons has been forgotten. While politicians talk glibly of 'weapons of mass destruction', nobody has any real feeling for what it means to experience intense machine gun fire, the kind of bombing that destroyed Dresden, or a nuclear holocaust. Nor do many people know that there are still about 30,000 nuclear weapons still ready for launch around the world. Doomsday Men aims to address that gap, focusing on nuclear weapons, but also looking at other forms of mass destruction. [...]Doomsday Men is ... important, and, depressingly, there is a need for it - people, especially younger people than me, ought to read it". "The story of the plan to create the C-bomb - a nu­clear bomb cap­able of dest­roy­ing all life on Earth - is chilling. Yet PD Smith's history, told with the joyful enthusiasm of a sci-fi aficionado, is also irresistible." "Smith does a fine job of diligent research and summary". "Weaving together biography, science and art, Smith has created a compelling history of physics in the 20th century... Smith's dynamic, riveting narrative reveals details of people, places and events that are rarely covered in textbooks, bringing to life not just scientists like Robert Oppenheimer and Leo Szilard, but the horrors of chemical and atomic warfare...Captivating and thoroughly referenced, this chronicle should interest a wide audience, from science and history buffs to armchair politicos." “Doomsday Men is prodigiously researched, the author seeming to have read everything on nuclear strategy, both fiction and non-fiction”. "The science is told with a Bill Brysonish kind of panache. But, at times, it becomes a cross between Bryson and Umberto Eco. There is a sub-narrative of esoteric knowledge and mysterious, astonishingly accurate predictions from HG Wells. Learned, accessible, and drawing occasionally on the stylistic skills of the novelist, this makes for a very good read." "One of the main strengths of this account lies in Smith’s ability to combine science, history, and fiction in an engrossing cultural history of one of the concepts lying at the heart of the Cold War. ... Smith charts out fascinatingly how the figure of the scientist fluctuated in the period from the turn of the twentieth century up to the 1960s between the polarized extremes of a role as saviour of humanity or its villainous destroyer." 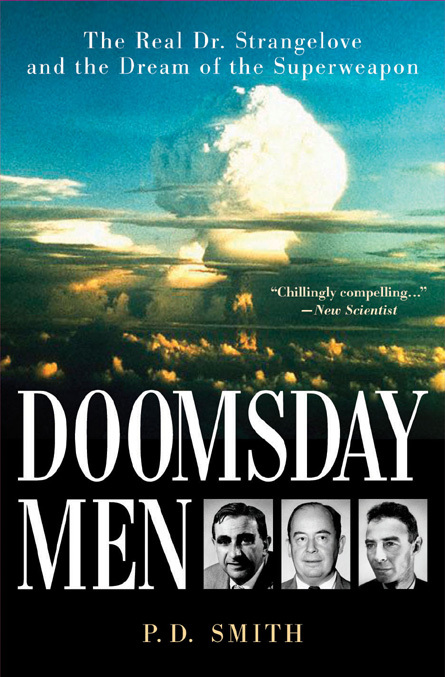 "British historian of science PD Smith masterfully chronicles the literary antecedents and cultural repercussions of the development of nuclear armaments... Doomsday Men offers a marvelous resource for understanding the issues and personalities underlying Kubrick's masterpiece and other creative interpretations of the Cold War. From pulp science-fiction stories to Godzilla's theatrical invasions, it is a veritable lexicon of atomic-age culture... With the Cold War fading into history, Doomsday Men offers a valuable reminder of the period's fears and foibles. It provides an outstanding guide to a pivotal era when humanity first faced the terrifying prospect of annihilation by its own hand." "...superb... The research is impressive, but it’s his eye for revealing anecdotes and his ability to distil it all into lively prose that makes this a real pleasure to read." “Doomsday Men doesn’t just deal with thermonuclear destruction. It’s a meticulous account of weapons of mass destruction and the science and scientists behind them. Indeed, it is two books for the price of one, because it is also a cultural disquisition. Smith scours fiction for visions of death rays and lurid imaginings of Armageddon to show how writers often preceded or influenced scientists. ... always readable and entertaining ... PD Smith deserves some sort of award for value for money”. "he puts the nuclear age into a new context, engagingly and even excitingly"
"... Doomsday Men is well worth reading. It is a powerful reminder that weapons of mass destruction are still 'out there' and new ones are being developed every day. But it is not solely about scientific knowledge; it ranges much wider than science fiction. It tells the story of disaster. One question is left hanging: will we allow our governments to repeat the mistakes of the last century?" "Smith entertainingly takes on Dr Doom and his colleagues, setting them in popular culture as scientific messiahs and madmen." "Told largely from the viewpoint of the scientists devoted to turning the military's demands into reality, PD Smith's account is packed with striking anecdotes... this is a readable, informative work exploring why intelligent men worked on such insane projects". 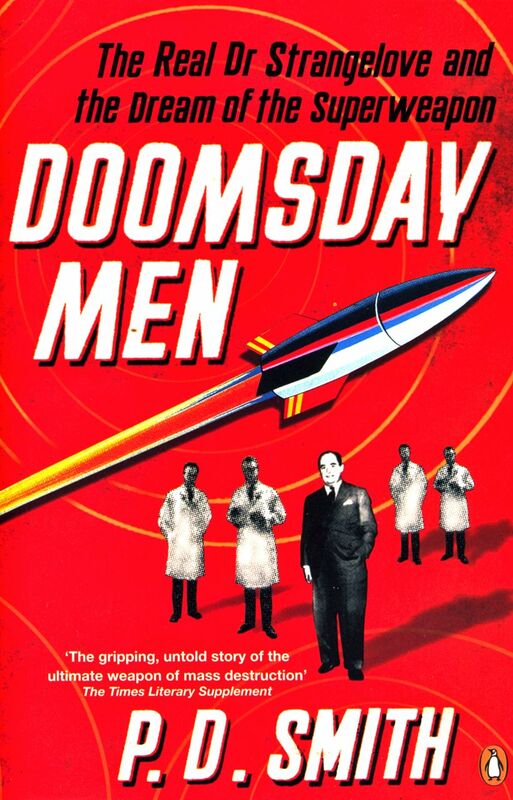 "This is the story of the men behind attempts to develop a superweapon - a weapon so utterly devastating that no force on Earth could overcome it... Doomsday Men is easy to read and gives a good insight into the personalities of some of the scientists involved in WMD." "Smith’s study is the gripping, untold story of the ultimate weapon of mass destruction, which first came to public attention in 1950 when the Hungarian-born scientist Leo Szilard made a dramatic announcement on radio: science was on the verge of creating a Doomsday Bomb. For the first time in history, mankind would soon have the ability to destroy all life on the planet. The shockwave from this statement reverberated across the following decade and beyond." "an illuminating, exciting and memorable read"
"Less than a decade after the first atomic bomb was dropped on Hiroshima, total annihilation of the human race haunted the imagination of scientists and writers alike, a convergence that PD Smith chronicles doggedly in Doomsday Men". "a comprehensive review of Cold War cultural history"
"[P.D. Smith] charts the ways in which science and science fiction interacted in a quest for Doomsday ‘superweapons’ in the 20th century. From HG Wells to Dr Strangelove and after, fiction has evoked weapons of mass destruction and their consequences, and created new horizons of possibility. Many scientists and policy-makers reacted to the possibilities, and from the First World War onwards, scientists worked with the military to produce the weapons and strategies that shaped the world in which we now live." "Smith delivers an indelible reminder that we ignore our worst nightmares at our own peril". "...for those with the time and inclination to get their heads around nuclear physics, with its dizzying intermingling of the massive and the infinitesimal, then P. D. Smith’s Doomsday Men is as good a place to start as any. Despite its rather titillating title and the schlock-horror gaudiness of its fifties-style cover, Smith’s is a hugely interesting history of some hugely difficult subject matter, in which the alchemy of nuclear fission and fusion is merely part of a wider story stretching back to the nineteenth century... Smith is no less fascinating on the pre-history of weapons of mass destruction, from the chemical weapons of the First World War, to Japan’s experiments with biological weaponry, to the bombing of German and Japanese cities (the accounts of which are scarcely less harrowing than the accounts of the effects of the atom bomb)." "...well-written and infinitely interesting. It is also incredibly frightening". "Smith...puts science's Faustian bargain through its literary paces".